"Daring Methods: The Prints of Mary Cassatt"
Mary Cassatt, Costume Study after Paul Gavarni, New York Public Library. Wallach Fund. Left: State i (ca. 1878), etching and drypoint, image 20.5 x 13.7 cm, sheet 26.2 x 20.4 cm. Center: State ii (ca. 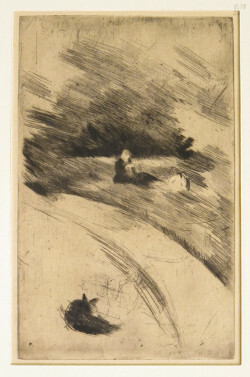 1878), etching, drypoint and aquatint, image 20.5 x 13.7 cm, sheet 26.2 x 20.4 cm. Right: State iii (ca. 1878), plate burnished with traces of etching and aquatint, image 20.5 x 13.7 cm, sheet 25.1 x 20.1 cm. 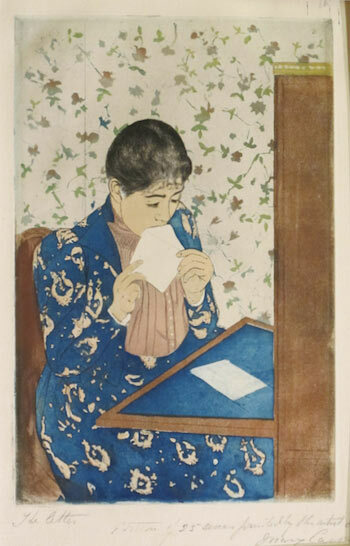 The New York Public Library’s current exhibition, “Daring Methods: The Prints of Mary Cassatt,” explodes this limited view, concentrating instead on Cassatt’s interest in experimentation and the profound technical expertise she brought to printmaking. A retrospective that runs from the artist’s earliest attempts at etching through to the late color prints, the show emphasizes the processes of conception, development and refinement. Cassatt’s subject matter remains significant, but here it is a means through which to trace the development of her thinking. Mary Cassatt, The Letter, State iv (1891), color drypoint and aquatint, image 34.6 x 22.8 cm, sheet 43.6 x 30.3 cm. Samuel Putnam Avery Collection, Print Collection, The Miriam and Ira D. Wallach Division of Art, Prints and Photographs of the New York Public Library. “Daring Methods” begins with one of Cassatt’s earliest graphic works, a costume study after a caricaturist of the prior generation named Paul Gavarni (1878). Cassatt’s friend Edgar Degas was actively encouraging her to make prints, and the etching shows her exploratory interest in the medium. Over the course of several states, she used a quotidian and borrowed subject—a bourgeois woman in formal dress composed by another artist—to investigate the formal effects of various techniques. In the first state, etching and drypoint are combined in a sketchy rendering of the woman, who is surrounded by blank space marked only by light flicks of the needle. Apparently dissatisfied with this composition, Cassatt produced a second state in which the background is filled entirely with aquatint. In the third and final state, the plate has been burnished to leave only blurred shadows of aquatint and ghostly traces of the female sitter. The dramatic transition between these states and the imperfect use of technique—the application of aquatint in the second state is especially uneven—suggest an artist embarking on a methodical exploration of printmaking. In presenting multiple states of individual prints, the library has provided the viewer with a rare opportunity to study the development of each image in detail; offered insight into the making of “original” prints at a time when they were subject to considerable new interest; and clearly demonstrated Cassatt’s preference for experimentation over perfection. Rather than working toward a single, ideal state of a composition, Cassatt often altered the appearance of her works slightly in ways that seem intended as variations rather than as part of a dialectical progression toward a final product. In the impressions of Sewing on the Grass (c. 1884), we see two very different images pulled from the same etching plate. The first is lightly inked and includes a dog in the foreground, highlighting the unusual use of perspective; in the second, far more heavily inked print, the animal is screened out along with the entire lower half of the composition. By emphasizing a multiplicity of states, the exhibition suggests both the additive nature of print processes and the artist’s commitment to experimentally reworking an image. Mary Cassatt, Sewing on the Grass, State i (ca. 1884), etching and drypoint, image 22.3 x 14.1 cm, sheet 33.8 x 27.8 cm. New York Public Library, Samuel Putnam Avery Collection. 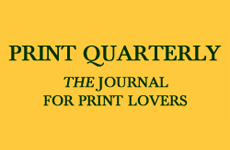 “Daring Methods” furthermore invites consideration of the roles of printmakers and patrons in the 19th century. The exhibition was put together from prints that were given to the library in 1900 by the art dealer Samuel Putnam Avery, and the social connection between Cassatt and Avery is fully acknowledged: the single lithograph in the show, for instance, is one of several prints bearing personalized inscriptions to Avery (in this one Cassatt describes the work self-deprecatingly as an “early and only attempt at lithography”). Dealers were vital to the careers of artists in the late 19th century as patrons and as advocates, and the exhibition includes an etched trade card by George Cruikshank and a painting by Ignacio de Léon Escosura, both depicting Avery showing art objects to clients in his gallery. “Daring Methods” presents an inclusive and informative vision of an artist and her time, and shows how the print, far from being irrelevant to Impressionism, became an essential element of the campaign to translate modern experience into art. “Daring Methods: The Prints of Mary Cassatt” is on view at the New York Public Library, New York from 8 March to 23 June 2013.